The 10 Best Christmas Tree Farms in Kansas! As the winter months start settling in, the bustling holiday spirit can be seen on every street corner. Everywhere you look, Christmas lights are starting to be strung along rooftops and beautiful wreaths are being hung on doors. One of the most classic symbols of Christmas is a gorgeous Christmas tree decorated with shiny tinsel and ornaments. Bring the spirit of Christmas right into your home by finding the perfect Christmas tree from one of these amazing farms! The Wilderson Tree Farm is a great-full service Christmas tree farm that offers a huge variety of trees. Their farm is located in Basehor and the great staff will help you find a Christmas tree for your family to decorate and enjoy. Complementary candy canes and hot chocolate are available as well! The Rocking M Farm in Junction City is a family owned and operated farm that offers beautiful Christmas trees and wreaths. They specialize in Austrian Pines and classic Douglas firs which can be cut down right in their field. Many other varieties are also available pre-cut and you can even pick up some custom ornaments while you’re there. Bel Tree Farm is one of the oldest family-operated Christmas tree farms in Kansas that has been operating since 1965. Their farm currently grows Scotch and Austrian pines that you can hand pick. Here you will find the best and most fragrant trees for placing in your home. Don’t forget to stop inside their wood-fire heated country store for a cup of complimentary hot cider and popcorn. The Mill Dam Christmas Tree Farm in Fredonia has over 1,000 planted trees with many different species available to take home. 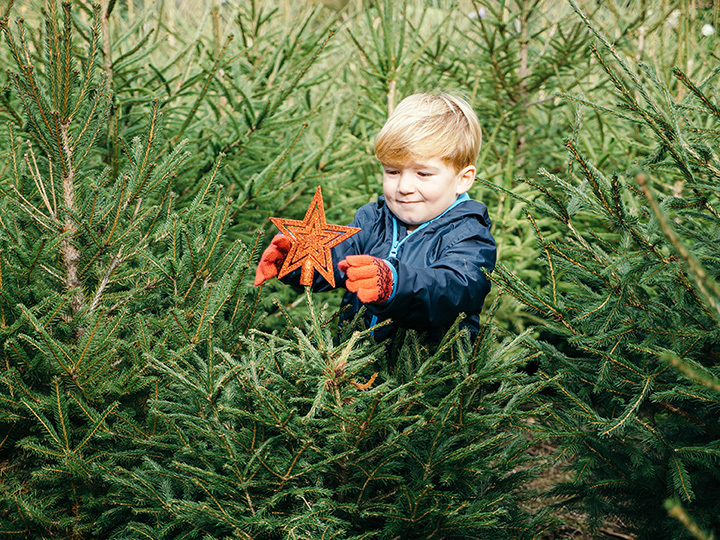 Take a journey with the family out to their farm to find and cut the perfect Christmas tree. Complimentary cookies and hot chocolate are available as well to help keep you warm. Country Christmas Trees is a large tree farm that has three walking trails available to find your next Christmas tree. The Elf Trail, Cedar Trail, and Deer Trail will take your through rows and rows of gorgeous trees ranging from five to 14 feet-tall. Feel free to hand pick your favorite one to bring home for decorating and an unbelievably fresh scent that will fill your home with Christmas spirit. Delp Christmas Tree Farm is a family-friendly farm that has fields full of beautiful Christmas trees waiting to be decorated. Grab the family in head out along the path to find the perfect Christmas tree you can hand-cut yourself. While you’re there enjoy a hot cup of cider and some of their fresh peanuts. Bierman’s Christmas Tree Farm has tons of fun activities for the whole family to enjoy. First, select your perfect Christmas tree from their wide range of trees which grow up to 18 feet-tall. Then stop by the heated barn and gift shop to pick out some Christmas souvenirs. They also have hot chocolate, wreaths, and an annual Christmas egg hunt for the kids. HalfDay Creek Christmas Tree Farm is a nice little tree farm located in Topeka where you can pick a tree from their selection Scotch pines and eastern white pines. Their family-friendly farm makes a great afternoon experience and is the best way to kick off the holiday season. Once you’ve found the right tree they will help shake the needles out and load it into your vehicle. Started in 1970, Lloyd and Marylene Schroeder planted the first Scotch Pine seedlings that would eventually turn into the giant Pine Creek Farm. Their huge farm is over 12 acres and they grow thousands of trees annually. Customers are provided a map, hand saw, and encouraged to head out into the farm to find any tree they want to take home. The kids will also have fun getting lost in their Candy Cane Tree maze. Head to the Prairie Elf Christmas Tree farm to find a fresh and fragrant Christmas trees ready for your home. They have hundreds of beautifully shaped trees to choose from and the farm is great place for families to relax, enjoy a hayrack ride, and even take a visit to see Santa.